The smell of the burning cherry wood is what will greet you first when you enter the grounds of Jim’s Smokin’ Que and the same smoky aroma is what will linger in the air as you leave. The smoke from the burning of the cherry wood rises from the ashes to create delicious food and special memories for the thousands of customers who come each year. And this phenomenon symbolizes the birth of Jim’s Smokin’ Que in Blairsville, GA. It is about the owners, Jim, Donna, and Lauren’s story of resurrecting beauty from ashes-that from ashes hope and peace can be revived, creating joy from pain. There is usually a line out the door- a line that curves around the left side of the porch onto the gravel parking lot. There is an ambiance felt the second you fall into the line, a feeling that settles into your heart as a place you will make many memories either on your vacations, day trips, or, if you are a local, becomes a consistent landing spot for one of your favorite and regular Saturday night dinners. A restaurant that comes into being such as this one is never an accident. It is more of a masterpiece born from blood, sweat, and tears. And in the creation of Jims Smokin’ Que, this could not be any truer. 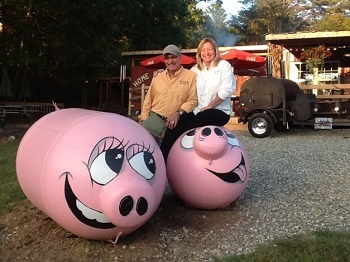 Jim and Donna Guess started Jim’s Smokin Que in 2010, and the restaurant has had incredible success since the beginning. The many accolades received for the distinct taste, quality, and originality of the food and the flavor speak for themselves. Recently named “GA’s Best Place for Ribs” and “Best Place in Georgia for Barbeque,” there is no doubting Jim and Donna’s talent when it comes to producing unique barbeque with exquisite flavor. And for Jim, Donna, and Lauren, it is a story birthed from both passion and pain. Fourteen years ago, before the Smokin Que opened its doors, Jim, Donna, and Lauren suffered a tragic loss. On Saturday, February 8, 2004, Jim and Donna’s thirteen-year old son Garrett played in his scheduled Union County Panthers Middle school basketball game. On that Sunday, he became acutely ill, and on that Monday, February 10, 2004, Garrett passed away from this Earth, into the arms of the Almighty God. He was thirteen. Four years after Garrett’s death in 2008 when the economic downfall occurred, Jim and Donna felt the sting financially. Jim, working in cabinetry, and Donna, working at a local produce stand and picking up other odd jobs like caregiving and pet-sitting, quickly realized that to make ends meet, they were going to have to make a change. In May 2010, they bought one smoker on credit and began Jim’s Smokin’ Que in the back section of a local gas station. They had six chairs to serve people and no extra money for marketing or advertising. Word of mouth regarding their delicious barbeque spread through the community and surrounding areas, and by April 2011, the current Jim’s Smokin ‘Que was constructed with the help of the community and Jim and Donna’s fellow church members.